I need to access multiple different VPN networks simultaneously, mainly for HTTP and sometimes SSH. Further, I am not allowed to use openvpn on my workstation (no legal restriction, rather an infrastructure issue). Port forwardings are fine. The following diagram is an attempt to picture the involved parties. My workstation wants to access host1.private-network1.de and host2.private-network1.de which are not visible to the internet. The institution requires me to enter their VPN for accessing this machine. 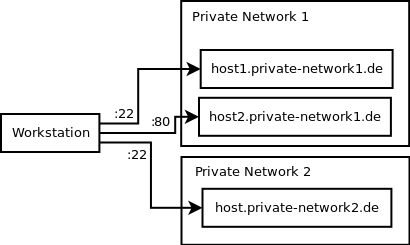 The same applies for the third host in the second private network. I need to access the machine on port 22 but this is only possible inside the VPN. The question is how to configure multiple OpenVPN networks in Linux, such that I can use simple port forwardings (as shown in the picture) to access different hosts in different private networks. The VPNs should only be used for this port forwardings. The remaining traffic on the proxy host (like updates) should not be routed via any of these VPN connections. It is even desirable that all the remaining traffic could still be routed via a third VPN, but this may be another question. I'm assuming both private networks provide a publicly accessible OpenVPN server, and push the appropriate routes. Just connect to all OpenVPN servers simultaneously from the proxy server. Run ip route show to make sure that default traffic is not passing through VPN. Replace <WORKSTATION_IP> with the IP address of Workstation (as seen by the proxy server) and host1.private-network1.de with the IP address through which the private host is accessible to the proxy server. In place, the proxy server allows for port forwardings using SSH. Don't use SSH tunneling. It is unreliable and slow. It's mostly used for creating temporary tunnels. Not the answer you're looking for? Browse other questions tagged ssh proxy openvpn ssh-tunnel socks or ask your own question. Can I use SSH tunnels as a VPN substitute?